Few bonding moments create lasting memories like a day of saltwater adventure with Dad. While just wetting a line together is a blast, fishing is always more fun when you’re catching. This Father’s Day, give him years of on-the-water excitement with gifts from Rapala® and Respected Rapala Brands. Responsible for landing more than 900 International Game Fish Association (IGFA) world record fish, with Rapala and Respected Rapala Brands you’re giving Dad more than just additions to his angling arsenal — you’re giving the excitement of a tough off-shore battle with the ocean’s most coveted game fish and a boatload of fun with his favorite fishing buddy: you. Hand-tuned and tank-tested to perform to the highest standards right out of the box, the Rapala® Saltwater X-Rap® and X-Rap Magnum® are ready to help your Old Man tango with the toothiest game fish around. A suspending bait with all the attitude of the original X-Rap, Dad can cast or troll this lure to achieve a tried-and-true “wounded minnow” presentation or rip and jerk it for a more erratic Slashbait® action. Either way — expect strikes from hungry predators. Built to withstand the rigors of saltwater fisheries with VMC® Perma Steel® Hooks, the Saltwater X-Rap is designed with an internal long-cast mechanism that allows anglers to chuck it a country mile. With prominent scales and an internal holographic foil that optimizes flash, it offers a display that challenges fish to bite. The Saltwater X-Rap is available in four sizes and seven perfectly matched saltwater patterns. A big bait designed to target big fish, the X-Rap Magnum features a massive diving lip that plunges the bait into the depths with no extra work from Dad. Available in four sizes that dive up to 30-feet deep, the lure can be fast-trolled at speeds up to 13 knots, making it a great choice for targeting behemoth game fish worldwide. Saltwater tough with a textured translucent body, internal holographic foil and models with colored lips for extra attraction, when fish chomp on to the X-Rap Magnum, it’s a done deal. As most saltwater anglers know, quality tools that can withstand the elements are crucial behind the scenes for a successful excursion. With Williamson™ Heavy Duty Saltwater Tools, the Big Guy will have the utmost confidence the next time he reaches to cut a line or remove a hook. Williamson’s Double Leverage Cutters, Double Leverage Pliers, Williamson Mono Shears and Split Ring Pliers are tough enough to scoff at the worst saltwater conditions any angler will encounter. Each includes enlarged ergonomic grips for added comfort and is crafted with stainless or carbon steel for extra corrosion resistance. Combining durability, comfort and ease, the Williamson lineup is a necessary addition to both the pro and amateur’s saltwater setup. After a successful day on the water, Williamson™ Saltwater Fillet Knives will help Dad make the task of filleting the day’s catch as enjoyable as it was to reel it in. Manufactured by Marttiini, the same company that has made the Classic Rapala® Fish N’ Fillet for decades, Williamson Saltwater Fillet Knives are available in three models — Curved, Straight and Slim — and multiple blade lengths, giving anglers an ideal option to handle redfish, tuna, wahoo and everything else the deep blue sea has to offer. Each Williamson knife features a progressively tapered stainless steel blade with a mirror-polished finish and razor-sharp edge that will slice through big and bony fish like butter. The ergonomically designed, co-molded handle offers a comfortable grip bordering on luxurious for big fillet chores following a particularly successful outing. Born on the rugged south coast of Africa, Williamson™ makes lures for those who thrive on the challenge of conquering the world’s largest fish. Williamson’s latest hard baits, the Popper Pro®, Surface Pro® and Speed Pro Deep® will perfectly fill out Dear Ol’ Dad’s saltwater spread. A lure that may look small, but promises huge hook-ups, the Popper Pro’s versatile design allows Dad to fish a wide variety of techniques — pop it on top of the water, slash and stall or walk the dog — for a presentation to fit any situation. Boasting an in-line hook designed for optimum swimming action, point exposure and hook set, the lure is available in seven realistic color patterns and two distinct sizes for targeting a wide variety of pelagic game fish. 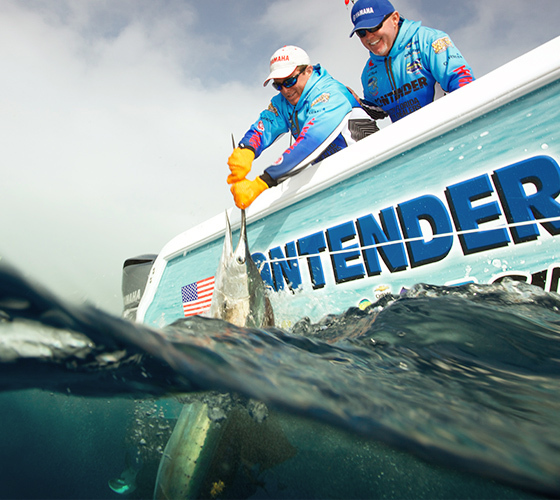 A versatile topwater plug for all saltwater game species, the Surface Pro is crafted with a precisely weighted body that allows anglers to achieve maximum casting distance. Perfect for in-shore and offshore applications, anglers can pop this chugger on the top, slash and stall or use the walk-the-dog technique to entice action from snook and tarpon as well as tuna and cobia. And, with VMC® Heavy-Duty In-line Hooks, when fish bite, they’re sure to hold on tight. Also available in two sizes and seven saltwater finishes, Dad will love watching fish charge to the surface to attack this bait. If Dad’s perfect day consists of an epic on-the-water battle, look no further. The Speed Pro Deep is the gift for him. Able to cruise at up to 15 knots thanks to the combination of a deep diving lip and “Auto-Tune” line tie system, this bait is perfect for trolling reefs or current rips for offshore or near-shore monsters. With a silky smooth, deep-down action that works great with lighter line, the Speed Pro Deep is available in two sizes and seven color patterns that fish find irresistible. Armed with VMC® Heavy-Duty Perma Steel® Hooks, this is one of the most brawny baits around. It’s time for the Pops to ditch that ratty old hat he’s been fishing in since you were wearing diapers, and time to start looking good when he takes a selfie with his next prized catch. This Father’s Day, hook him up with stylish, yet comfortable apparel from Rapala®, Williamson™ and Sufix®. He’s sure to look like a pro when he dons a new Rapala hat and track jacket or a long-sleeve tee from Sufix® or Williamson that’s perfect for off-shore angling. Great for outings on the water, but appropriate for a night at his favorite haunts around town, Dad will be the best-dressed angler in the boat. With overnight shipping available (if ordered before 1 p.m. CDT), you’ll have these great gifts in-hand in no time. Stop by your local sporting goods store or visit rapala.com to purchase can’t-miss Father’s Day gifts. Be sure to check out Rapala® on Facebook for special offers, tips and techniques, new product updates and much more. This entry was posted in News, Rapala, Sufix, Williamson. Bookmark the permalink.